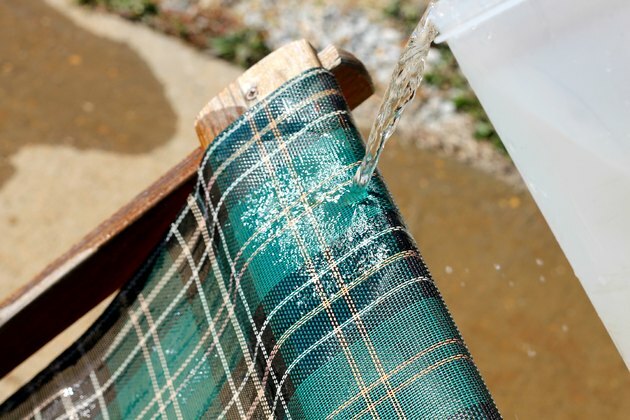 Even though one of the most common ways to get rid of mildew and grime on patio furniture is a vinegar solution, vinegar may actually damage the mesh, depending on the type of mesh furniture you have. Some mesh fabrics don't stand up well to acid-based or vinegar solutions. Check the manufacturer's care tag for specifics, but, when in doubt, a powdered detergent and water mixture is the safest solution. 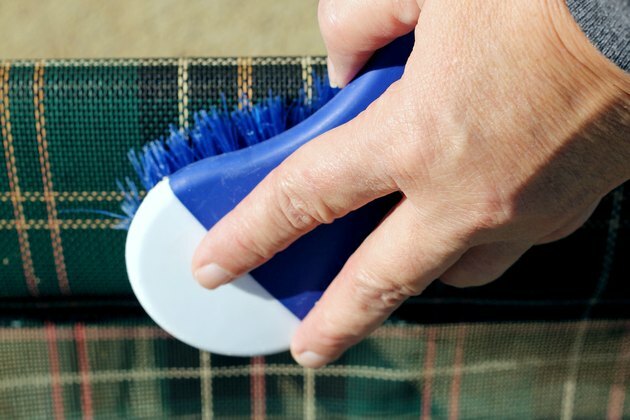 Lightly brush the dirt from the furniture with a soft-bristled brush to remove any excess debris and stuck-on dirt. 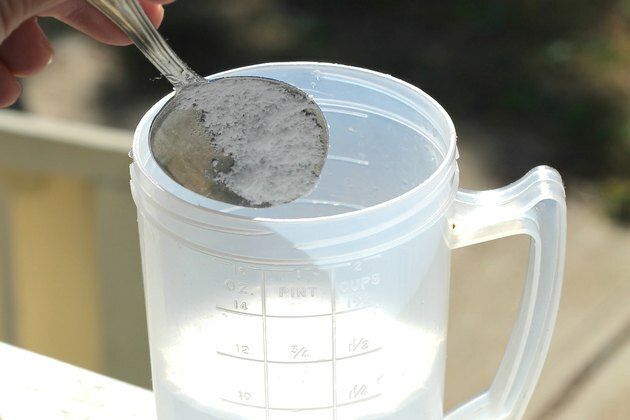 Dilute 1 tablespoon of powdered detergent in a cup of warm water. Mix it thoroughly until the powder thoroughly dissolves. Wet a corner of the dry, clean cloth in the solution. 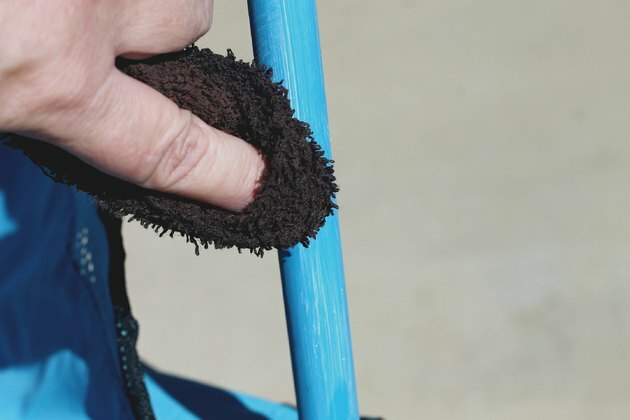 Clean the mesh sling patio furniture starting at the back of the chair, working down the material. Repeat on the back of the chair. 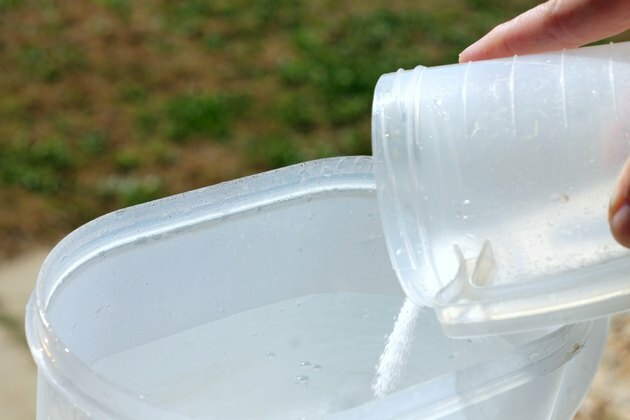 Fill a bucket with warm water to rinse the soapy residue from the furniture. 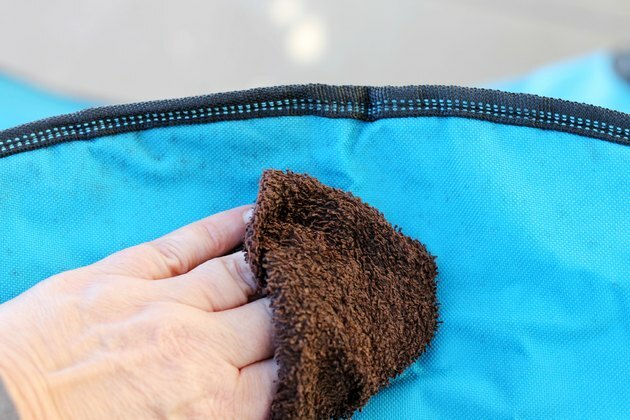 After it's thoroughly rinsed, wipe down with a soft cloth. 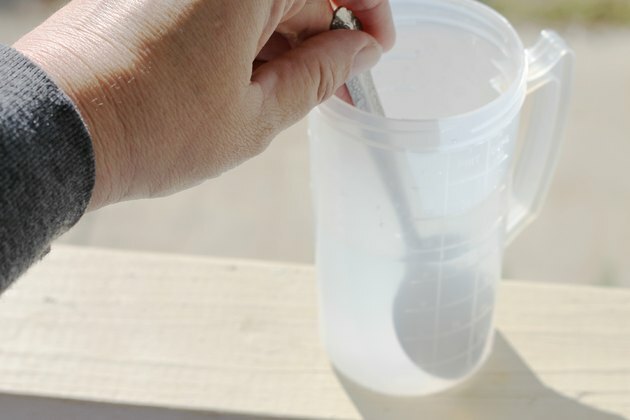 Mix 1/2 cup of oxygen bleach, 1 cup of powdered detergent and a gallon of warm water in a bucket after dry-brushing the furniture to remove stuck-on dirt. 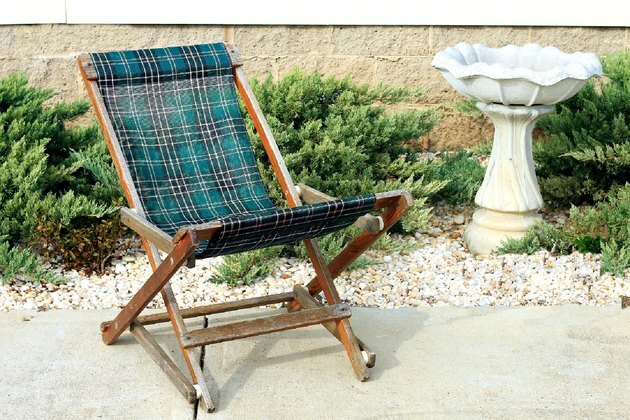 Apply the solution to the chairs or chaise lounges, wiping from the top down with a clean cloth. Repeat on the backside of the furniture. Rinse with warm water. Dry with a clean cloth. 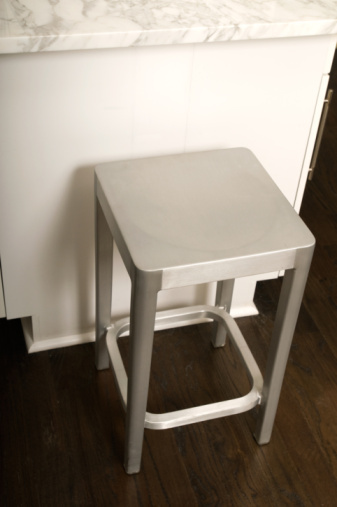 Clean the metal arms and frame of the furniture using 1 tablespoon of powder detergent and 1 cup of warm water. Ensure the solution is thoroughly mixed before cleaning with it. 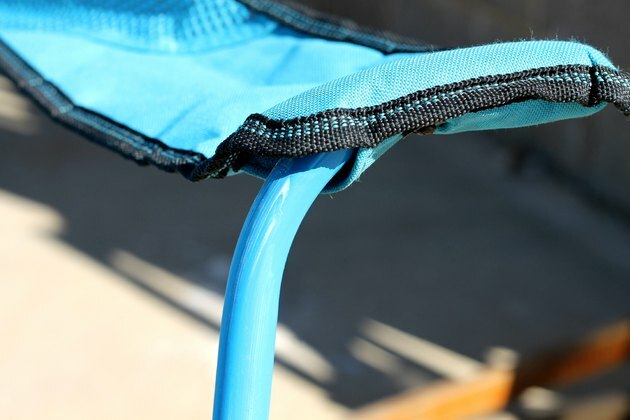 Rinse the metal areas of the chair with warm water. Dry with a soft cloth. Apply a furniture paste wax, if it has scuffs, or to restore the shine to the furniture's frame. Lightly rub on the wax in small, circular motions with a clean cloth. Let it dry until it takes on a milky appearance. 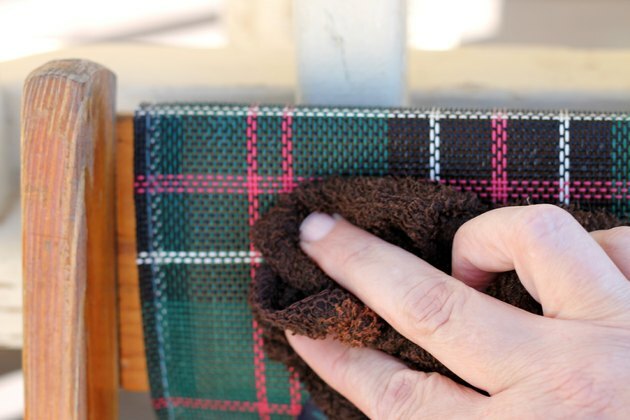 Avoid getting the wax onto the fabric or plastic mesh material. 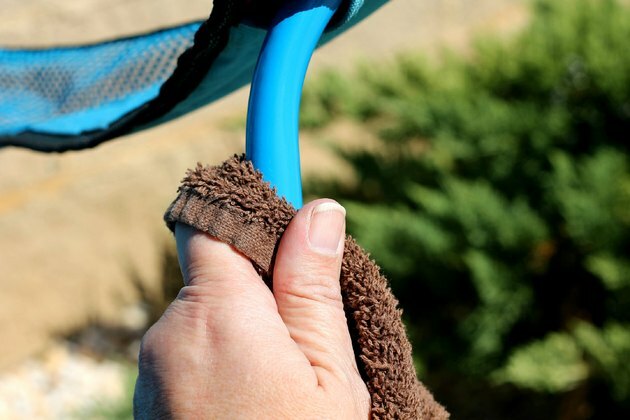 Buff the metal frame with a soft, clean cloth, rubbing in circular motions to remove the wax.